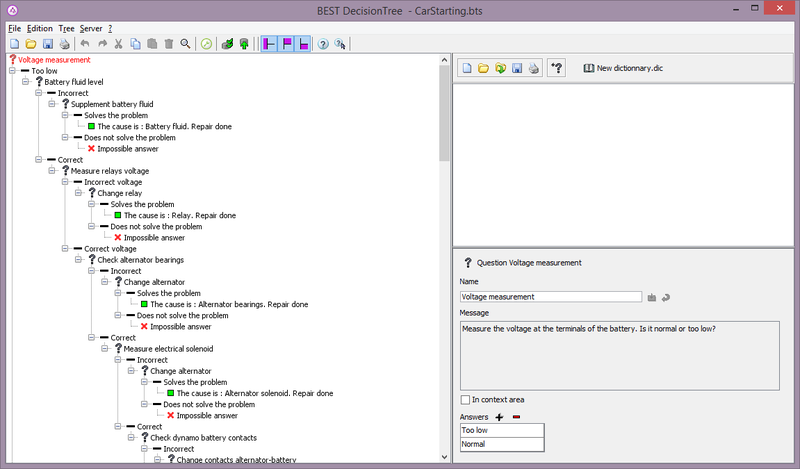 BEST Decision Tree is a graphical editor of procedural knowledge encoded in the form of decision trees. It can be used to prescribe a specific course of action for certain troubleshooting tasks. In addition to BEST Author (or replacing it, in certain cases), BEST Decision Tree allows to create prescriptive models for use in BEST Troubleshooter in order to ensure compliance with norms and regulations. BEST Decision Tree allows linking to external troubleshooting models, i.e. models created with BEST Author or BEST Decision Tree. Furthermore, BEST Decision Tree can be used to structure the available expertise in such a way that a technical support can be escalated appropriately, gradually increasing the expertise required for handling a case.